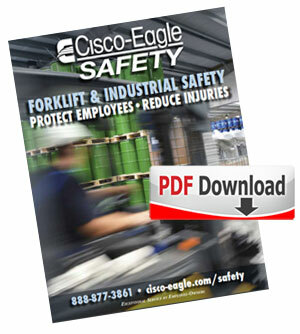 We’ve added a safety products catalog in convenient PDF download. This catalog covers a range of pedestrian and traffic management options available to facility managers and operators who want to improve safety for pedestrians who work near and around forklift traffic, including warehouse safety sensors, AisleCop® automated safety gate systems, safety gates for mezzanines and docks, an array of protective guard rails, and more. We also touch on safety guards for racks that help reduce the chances of product spills following forklift collisions, loading errors and other mishaps. In warehousing and storage operations where inventory is stored high on racks, it’s a sad fact of life: sometimes pallets or cartons fall. They fall because they’re stacked wrong. They fall because an order picker or a forklift bumps them. They might fall because the pallet breaks or was poorly stacked. They fall due to seismic activity, rack failure, or just plain mistakes. There are plenty of reasons they fall, but how can you reduce your risks? This article is part of a series of articles on Falling Item Prevention. Click on a link below to view one of the other articles. In today’s fast moving storage operations, mobility, flexibility, and convenience are critical for keeping up with the rapidly changing demands of operations like assembly and order picking. 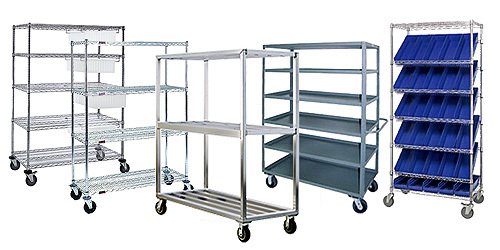 Industrial shelving has evolved from simple bolt-up static types to a variety of mobile configurations that serve specific applications. Here are some ways to improve your operation by adding mobile shelves. This article is part of a series of articles on Industrial Shelving. Click on a link below to view one of the other articles. 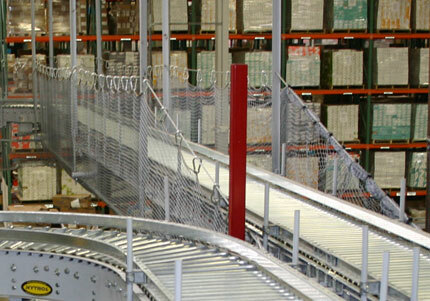 Conveyors are often installed overhead or suspended from the ceiling to help conserve floor space or to interface with mezzanines or platforms. This may create potential fall hazards. Loads can fall from inclined conveyors as they are conveyed up or down, or be subject to other factors that can cause a fall from any elevated line. Even on a floor mounted conveyor a spill can split a case, land on an order pickers’ toes, or damage inventory. 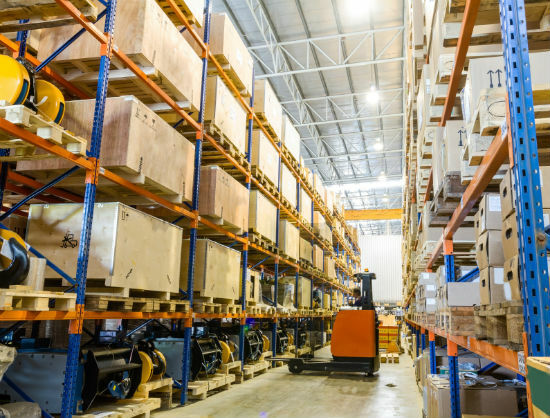 In warehousing and storage operations where inventory is stored high on racks, stacked on floors, slotted into on multi-level shelving, mezzanine deck-overs or on suspended/overhead conveyor as it moves, there is one constant: things will fall. They fall because they’re stacked wrong. They fall because an order picker or a forklift bumps them. Things fall due to seismic activity, machine stops, or silly mistakes. Sometimes it seems like they fall for no reason at all. What can you do to “stop the drop”? Is your facility in a seismic zone? Are you sure? An increasing number of areas across the United States are demonstrating geological stresses and increased fault pressures that lead to earthquakes and smaller seismic events. So much more that our national seismic map was recently updated to include areas of the northeast and southern tier states not previously known for earthquakes, as well as enhanced zone classification in the inter-mountain west and known fault areas. Are you sure your pallet rack is correctly configured to withstand seismic ground forces? 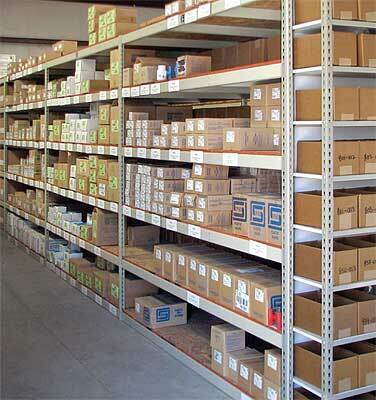 It’s common to store large amounts of inventory on industrial shelving. The diversity of that inventory–bins full of parts, boxes of varying weights, and other odd loads–can contribute to the dangers of falling product. Shelves are accessed frequently and by a variety of people, meaning that every time they are loaded, unloaded, picked or bumped, a spill could happen. 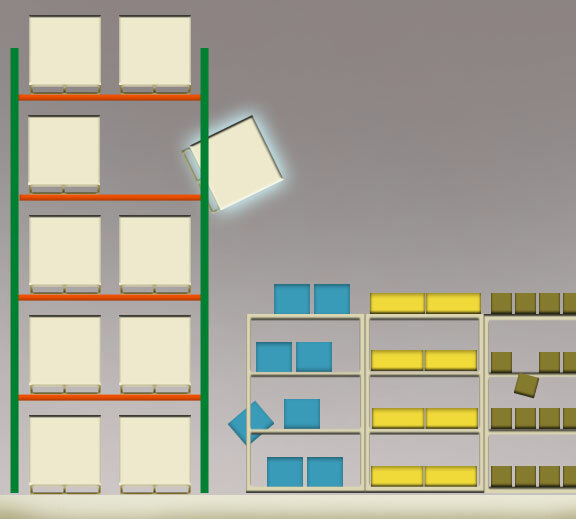 A falling shelf load could cause worker injuries and of course ruin your inventory. What can you do about it?